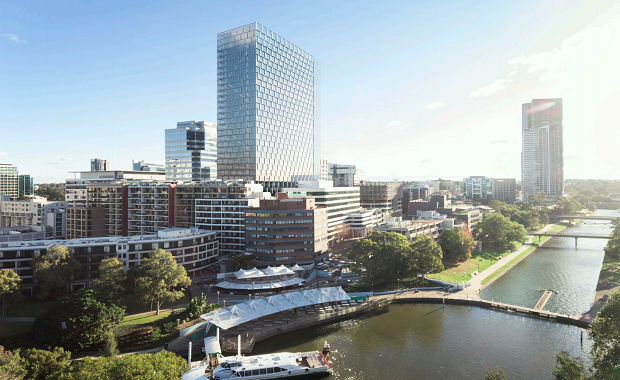 ASX-listed property group Dexus have submitted a development application to the City of Parramatta for a 33-storey commercial tower with an estimated cost of over $208 million. 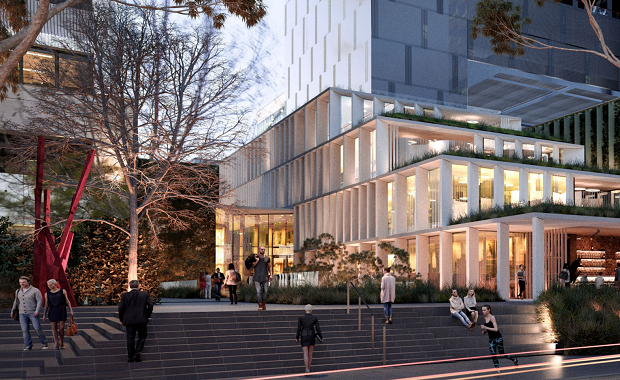 Located at 140 George Street Parramatta, Dexus’ Bates Smart-designed proposal includes a tower with a stepped podium, landscaped roof terraces and new active landscaped plaza. Dexus' brief stipulated that the building is required to meet the Property Council of Australia’s A-grade commercial standards and minimum 5 Star NABERS and Greenstar sustainable initiatives. The development will link Phillip Street and George Street through its plaza while providing commercial office accommodation with 48,338 square metres of additional ground floor area, which includes 655 square metres of new retail space. Recent projects in the area includes the redevelopment of the Parramatta Mission and Uniting Church, a new Powerhouse Museum, several projects in the Parramatta Square precinct including a new civic building, and a $380 million mixed-used development in Parramatta’s “auto alley”. 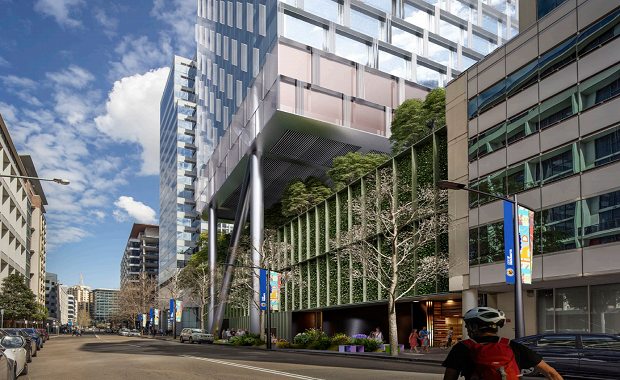 Dexus’ George Street proposal reflects the significant change currently taking place in the area. It is one of many potential commercial opportunities -- the site already accommodates a 16-storey and a 23-storey commercial building, but the developers are hoping to bring something of a "higher calibre". The George Street location is approximately a 5-10 minute walk from the civic centre and Parramatta Transport Interchange and is also close to the Parramatta Ferry Terminal, providing excellent access to public transport and pedestrian links to the CBD’s retail and services core. The site also offers direct access to Parramatta riverside walk immediately to the north and public recreation open space of Robin Thomas Reserve to the east. “This development will further contribute to the revitalisation of the riverside precinct and provide a high quality commercial office effectively extending the CBD to the River." 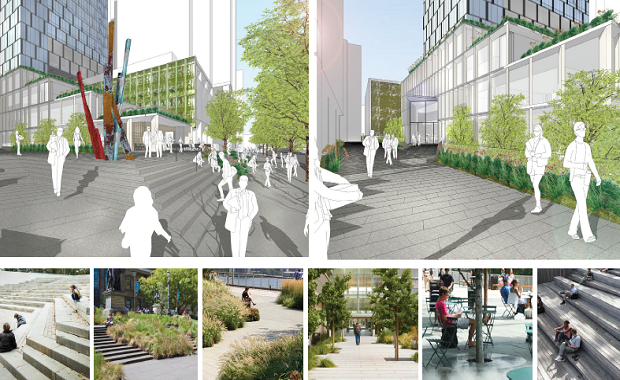 The proposal creates a new public plaza off George Street that acts as a forecourt to the commercial development. Areas of retail activate this public space and external seating such as bleachers and cafe retail seating provide opportunities for gathering. The plaza wraps around a sunken court or garden that enables the lower levels access to daylight and provides an accessible garden for relaxation with a lush backdrop to the wellness centre. Retail is also proposed at Charles Street with an upgraded landscaped public domain to activate underutilised street frontage. The George Street tower will provide a lower ground level with accommodation for an expanded end-of-trip-facility that could include a pool, spa, yoga studio and gym and change room facilities. “The interior space wraps around two sunken gardens, with lush planting and seating which will provide quiet semi-private courts for recreation and respite whilst provide an excellent backdrop for the exercise and wellness facilities at this level,” the proposal said. According to the proposal, the podium levels are planned as support multi-purpose areas that act as “public interface” functions for the building. The roof terrace at Level 31 is located on the eastern portion of the building to take advantage of the best views along Parramatta River towards Sydney CBD skyline. This space is proposed to be landscaped and will have a glazed perimeter facade to protect from wind. The application was lodged earlier in September and is to be determined by the Sydney West Central Planning Panel. Images courtesy Bates Smart via City of Parramatta.